What is the Service View and how to use it? Learn how to use the Service View and understand its tools of queue management. The Service View is the center of queue management. 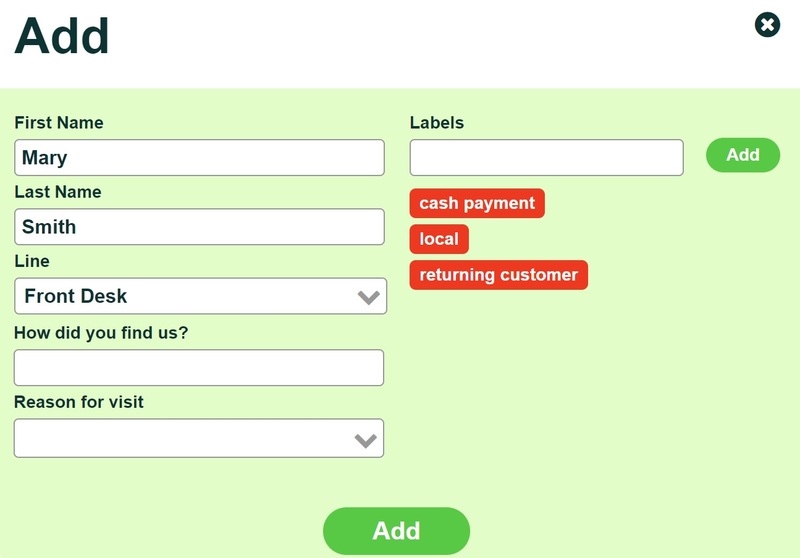 This is where you can see all the visitors in line, fill in their information, make changes and decide the next step. The left side of the Service View displays a list of visitors in line and the right side shows the currently called visitor. Visitors are added to the queue list automatically if they have signed up on the iPad, but you can also add visitors manually by clicking on the ADD VISITOR button. You can mark quick notes about visitors by adding descriptive Labels. Location managers and administrators can add additional fields with Input Fields. Clicking the CALL NEXT button marks the current visitor as served and calls the next visitor from the line. The TV will display the called visitor's name. Call Again - The TV displays the call notification again. No Show - Marks the visitor as missed their turn. Mark Served - Marks the visitor as served without calling the next visitor. Return to Queue - Places the visitor back into the same line. Forward - Places the visitor into a different line. Edit - Make changes to the visitor's information. Label - Add and remove labels. Chat* - Text message the visitor. Lines - Decide which lines to display by selecting and deselecting the line names. Desks - Pick the desk number which will be displayed on the TV to called visitors. Call - Calls the selected visitor. 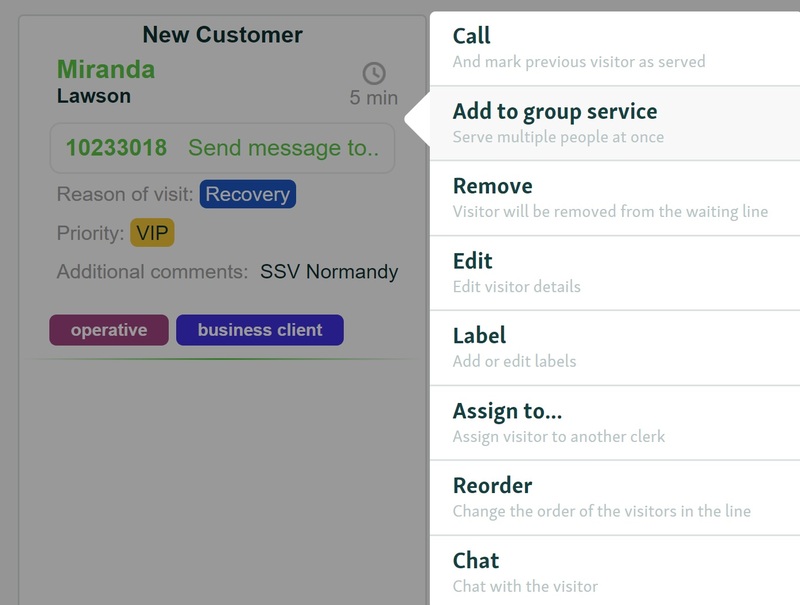 Add to group service - serve multiple visitors at the same time. 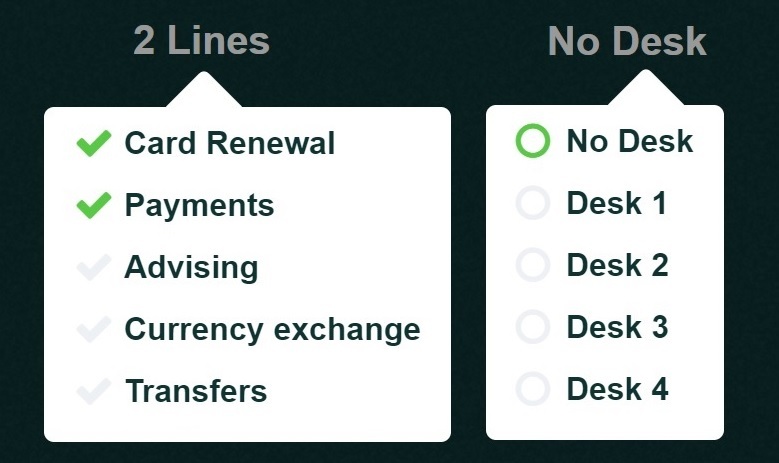 Remove - Removes the selected visitor from the line. Assign to... - Assign the visitor to a specific clerk. 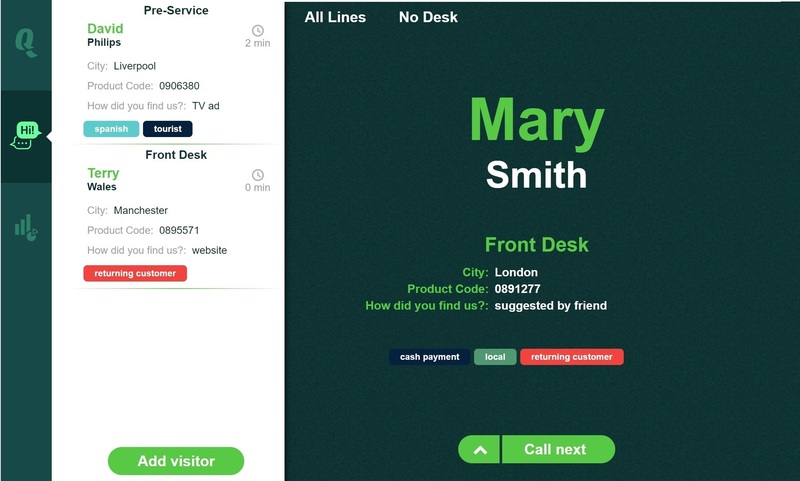 Reorder - Change a visitor's position in line by drag and drop. *Texting is only available for Pro Plan subscribers.